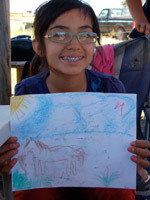 For the past three years, the Buffalo Woman Ranch has had the great joy of offering a summer horse program for Navajo students attending Aneth Community School in Utah. This program has included lessons in vaulting, horse handling and grooming, equine experiences with a horse at liberty in a round pen, arts and crafts and ongoing academics with language arts/reading and writing focused on horse anatomy, stories and games. This program has contributed to the growth of each student in a myriad of ways. Developing self confidence, self awareness, leadership and trust are just a few. Each student rotated through the various activities during their 5 hour visit 2 days a week. They were given the opportunity to develop vaulting skills as they progressed through the training to the level of vaulting on the horse either at a standstill, walk or trot (performing ‘the flag’, or ‘around the world.’) Skills in leading a horse, asking a horse to move around the round pen, going on a ‘journey ride’ and simply connecting with their equine partner in a gentle, present way was all a part of the experience. Last summer included an edible plant and herb walk as well, with a variety of plants and flowers in bloom. Lunch was a big hit. Plenty of good food was served up for all who participated! We are eternally grateful for the expertise and dedication of all the instructors and volunteers who contributed to the success of this program. We celebrated with music, songs, and heartfelt ceremonies filled with laughter, tears and gratitude for the transformation provided from this equine experience. May the “Way of the Horse” continue to create beauty for all. Open Sky is a wilderness-based treatment program serving teens and young adults dealing with severe emotional and behavioral problems. Young adults, along with their families, have enjoyed visits to the Buffalo Woman Ranch for equine experiences. 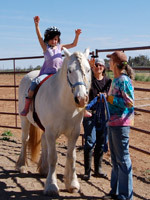 The Buffalo Woman Ranch offers equine experiences for children of all ages. We provide lessons in vaulting, horse handling, grooming and riding. 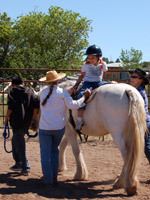 Your child may gain skills in leading a horse and asking a horse to move around the round pen. We also offer journey rides, arts and crafts activities and nature experiences. Please contact us to set up your personalized children’s package.